This site has been moved to livingsimplewithsue.com. Looking for an easy to make, warm your belly, fill your tummy soup? 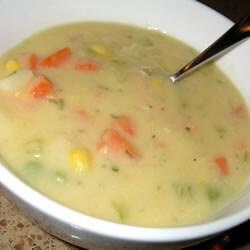 Then look no further as this easy potato vegetable soup fits the bill. This soup is the perfect combination of basic pantry and refrigerator items including chicken broth, cream of celery soup, canned or frozen vegetables, potatoes, onions, carrots, and seasoning. In a large stock pot, add all ingredients except for cream of celery soup. Cook until potatoes have cooked to consistency (about 30 minutes). Add celery soup and cook at reduced heat for another half hour. Ladle into bowls and add salt, pepper, and additional Italian seasoning to taste. Soup tastes better the next day so you might want to cook the night before, reheat, and serve. You can also make this soup in a crockpot. Just add all ingredient and cook for 4-6 hours on the lowest setting on your crockpot.